Real Talk panelists at our August 2nd event in New York. For years I’ve been hearing tech leaders talk about an inability to find and hire diverse talent. This sounded foreign to me as I knew we existed, but for some reason the pipeline of diverse talent was invisible to hiring managers. Larger tech companies have been implementing various Diversity and Inclusion (D&I) programs since the 1980s and 90s. Their primary focus was to mitigate the risk of lawsuits — not to increase diversity in the talent pipeline. The programs often failed to encourage a culture that values equality and inclusion from the C-suite on down through the organization. Today, 8 out of 10 underrepresented minorities in tech report being treated unfairly at work and ultimately leave their companies. As a whole, women leave the tech industry at a rate 45% higher than men. The reality is that many D&I programs, and the Chief Diversity Officers (CDOs) who champion them, have not been properly equipped to make impactful changes in how their companies recruit and retain diverse talent. Yet, the question still remains: what would it take to make these programs successful? And what should success really look like? There simply hasn’t been enough industry-wide transparency to identify what’s working and what isn’t. That’s why we started Real Talk: Diversity in Tech. Those in leadership positions often failed to really listen, one on one, to underrepresented minorities in their companies when they were willing to reveal their experiences — for better or worse. Software engineering, talent acquisition, and diversity and inclusion team members often failed to connect with each other, despite having a common and vested interest in creating a diverse and inclusive environment. It was clear that a place to connect these folks at a larger scale was needed — a sort of unplugged session where ideas can be exchanged off the cuff. Suddenly the concept of Real Talk: Diversity in Tech was born. To date, we’ve co-hosted Real Talk events with Indeed, Chan Zuckerberg Initiative, Snap, and Convene. On January 17th we will host our next event with Dropbox. Each one brings new learnings and insights. However, four issues facing diverse tech talent surface again and again. Many students that are underrepresented minorities don’t envision themselves working for a major player like Apple, Facebook or Google. This is often attributable to lack of exposure to the tech industry. It’s much easier for a young person whose aunt worked in the tech industry to understand the benefits of such a job and how to get one. But much harder for one who didn’t have the internet growing up, let alone a family member or close friend who understands how to navigate the industry. For those that do decide to enter the tech industry, they may find they’re unsure what kind of compensation package they should expect. As a result, it sometimes ends up being lower than market, creating a wage gap that persists throughout a person’s career. Companies can look for more ways to engage with students and other candidates looking to enter the tech industry early on. Being open about what life is like at their company, what to expect in the interview process, and how their compensation and benefits work can go a long way to granting access to knowledge that was previously inaccessible. First impressions matter. Yet, sometimes companies forget this. Candidates will feel much more comfortable, and much more likely to continue through the hiring process, if they feel that the playing field has been leveled for them and everyone else interviewing for the same job. Companies can help do this by using a structured interview and communicating the format and criteria for success. Companies should start viewing culture as something that can be added to as opposed to something that candidates and employees need to “fit into.” At its core, this is the idea of inclusion. Embrace the differences as a positive addition to company culture. People don’t need to think alike, look alike, or act alike in a corporate environment. There’s a mix of customers so there should be a mix of employees — at all levels. The expectation to fulfill one’s official job responsibilities while also helping with recruitment can be overwhelming. Many find they’re working 80 hours a week for the same 40 hour salary. Most underrepresented minorities want to help with any efforts aimed at increasing diversity in the talent pipeline at their company and it is absolutely important that they do so, as it is likely to encourage diverse talent to join the company. Companies can help by encouraging more employees to get involved to lighten the load and be mindful of job performance expectations as they may need to be adjusted to accommodate recruiting duties. It probably goes without saying — this will become easier and less burdensome the more diverse a company is. It’s no secret that there are overwhelming cultural and systemic issues are facing diverse talent and preventing equal opportunity for economic empowerment. At Karat, we care deeply about leveling the playing field for candidates from all backgrounds so that they have access to knowledge about the tech industry and access to the opportunities it can provide. As many of us look for ways to make our organizations more diverse and inclusive we often overlook the very simple act of listening and then starting a conversation. That’s what Real Talk is all about. 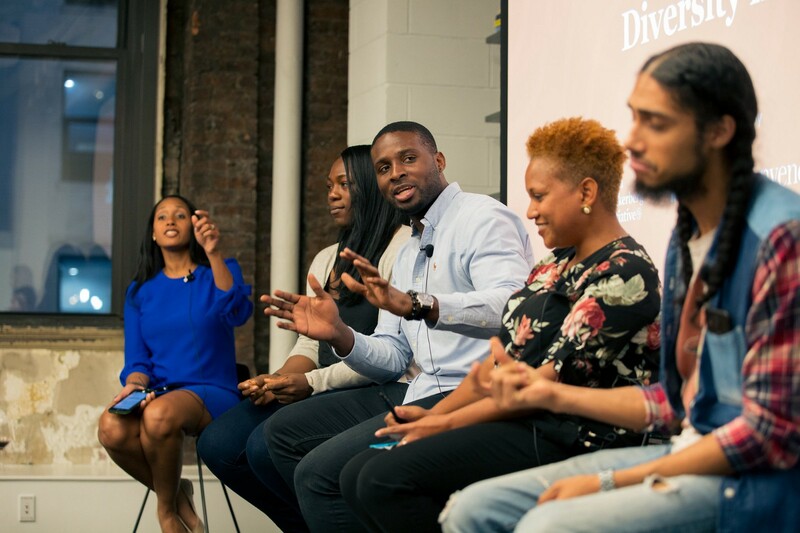 On January 17th, we’ll host Real Talk: Diversity in Tech event at Dropbox headquarters in San Francisco. We hope to see you there.